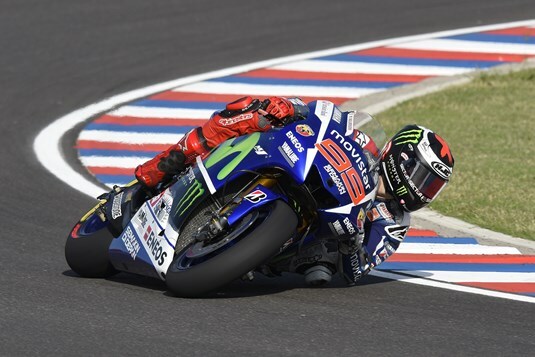 Movistar Yamaha riders Jorge Lorenzo and Valentino Rossi were back on track today in Argentina in qualifying for tomorrow’s Grand Prix de la República Argentina. The duo enjoyed the best weather conditions yet of the weekend with sunshine and a dry track, Lorenzo taking fifth on the second row and teammate Rossi taking eighth on the third. Mallorcan double premier class champion Lorenzo was as usual the first man on track and quick to break under the 39s with a first hot lap of 1’38.485, securing provisional second in the first flurry of activity. Unable to improve on the time he returned to the pits for fresh rubber before hitting the track again with just under seven minutes remaining. The second stint proved challenging and he was unable to better the first hot lap, settling for the second row start tomorrow. Teammate Rossi‘s first flying lap put him into eighth in the standings with a 1’39.631. He then picked up the pace a little, dropping half a second to follow up with a 1’39.116, moving briefly to fifth before a flurry of competitor laps dropped him to sixth. He returned to the pits for a new rear and was back out with six minutes left on the clock. A last minute push was enough to break under the 39s and deliver a 1’38.890 for the third row. Monster Yamaha Tech3 Team rider Bradley Smith will launch from the head of the fourth row of the grid for the Argentina Grand Prix at the fast flowing Autodromo Termas de Rio Hondo. After finishing this morning’s free practice 3 in 13th, which saw the British rider qualify for QP1, the 23 year old concentrated on assessing different setup options in FP4 as he completed the session in 12th position. With the sun shining down on the circuit for the crucial qualifying sessions, Smith shot to the top of the heap with an impressive lap of 1’38.956 during QP1. This time permitted the Briton to progress through to the final 15 minute shootout. Smith powered onwards as he sought a top grid position and set his personal best on the 6th lap with a 1’39.197 which confirmed his starting position of 10th tomorrow. The young British star remains confident for tomorrow’s race where he will intend to once again challenge for the position of the leading satellite bike in the premier class. It was an uphill qualifying for the riders of the team Athinà Forward Racing on the track of Termas de Rio Hondo this week, which is hosting the Grand Prix of Argentina. Stefan Bradl will start tomorrow in 16th place on the grid while Loris Baz will start from the 22nd place. Bradl is satisfied with the improvements made to the bike during the day, even if he is still struggling to find the right feeling with the tires. The German has posted a personal best of 1’39.734, which earned him third place among the Open just a few tenths from his rivals. Loris Baz had also some lack of confidence with the tires; he set his personal best of 1’39.972. The Frenchman is getting closer to the top of the Open class and will start tomorrow aiming the first points of the season.